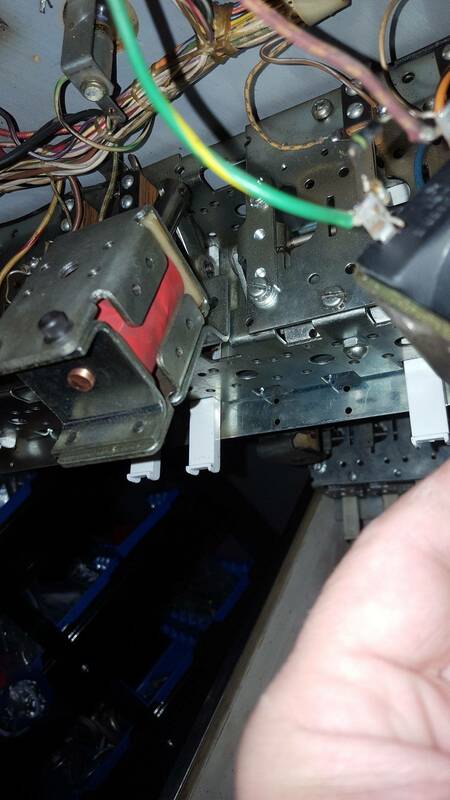 » Forum » Tech » Tech: Early solid state » Anyone ever seen this on a drop target bank? » Anyone ever seen this on a drop target bank? 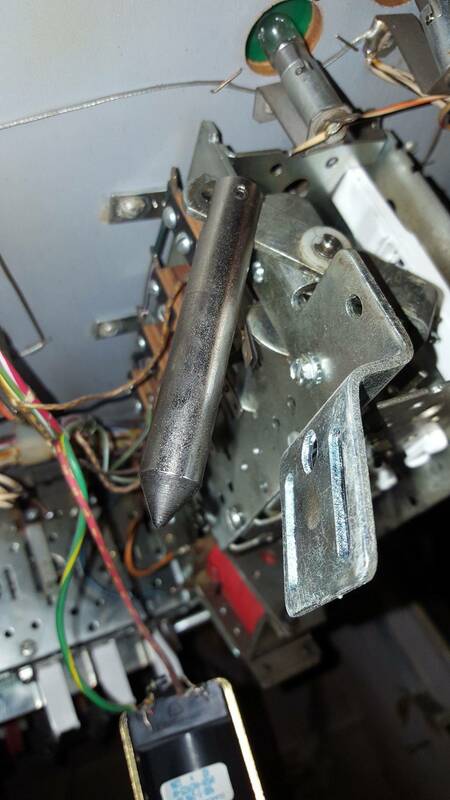 Anyone ever seen this on a drop target bank? I'm currently fixing up a joker poker and the drop target bank coil , coil cage and plunger are very different from any I've ever seen before. The coil is fully enclosed in plastic and the plunger has a pointed( tapered ) end. It ohms twice as high as a regular coil on a different bank but works perfectly. Anyone know where this came from. It looks like it was designed to be used for this but that's hard to believe. I've included a pictures of what it's supposed to look like and what's actually there. Yup, I have.......but it was at your place. That is just bizarre, well done but strange. And that plunger is not homemade. It's high quality factory made. The whole assembly looks and feels very high quality. The classic Gottlieb coil A-18102 has been replaced by a more modern model, available in the today industrie. 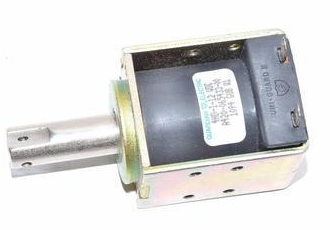 The "G" logo on the solenoid indicates that the manufacturer is "Guardian Electric Manufacturing Co."
This company is specialized in building solenoids, relays and switches. By a coincidence, it is localized in the Illinois at Woodstock, not very far from Chicago. The model used on the bank target look to be a standard and not specific made. 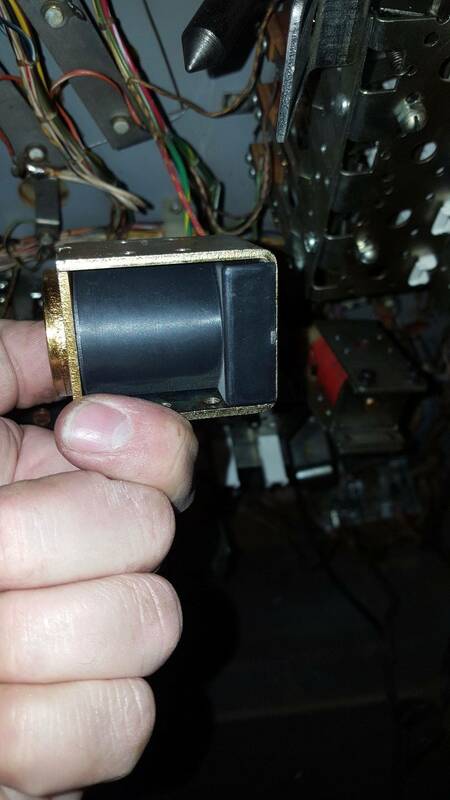 May be interesting to get a picture of the label of your coil, to see what model they exactly use to replace the A-18102. 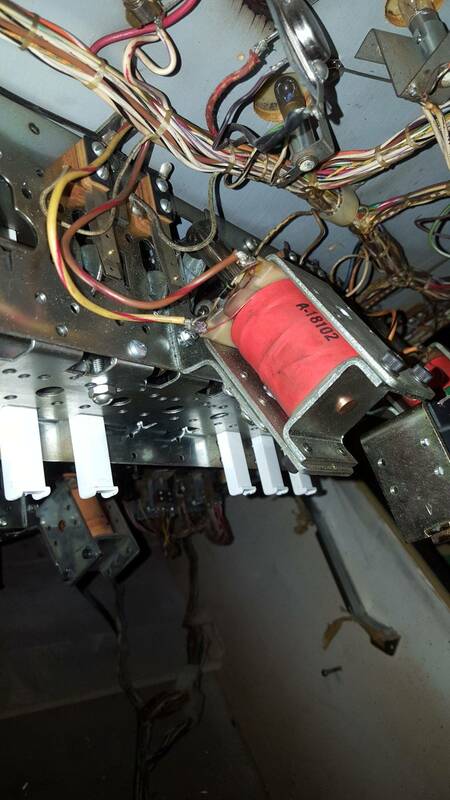 Yup, someone has installed a commercial Guardian Electric solenoid in place of the original Gottlieb assembly. It's always nice to found some alternative with modern elements. The characteristics are not exactly the sames, but the most important is that's works very well. 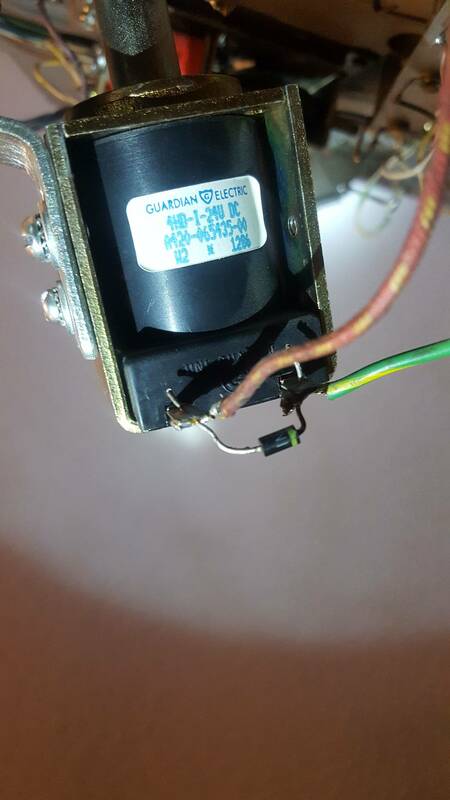 The datasheet of this coil can be easily found at the Guardian Elec. website. 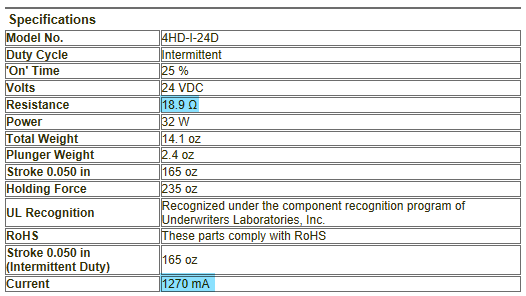 The resistance of the A-18102 is about 9 Ω, and the resistance of the 4HD-I-24V DC is about 18.9 Ω. This means that the new coil use less current. It's a good thing, because there is no need to change the transistor driver, nor the fuse. The counterpart is that the coil is (theoricaly) less powerful. But in practice, it works. As far I see, on your Joker Poker, it is used on a 4-targets bank, so it's should be enough powerful for all other models. Guardian says also, they can produce special coils/plunger on demand, but I'm not sure that is the case for this one. 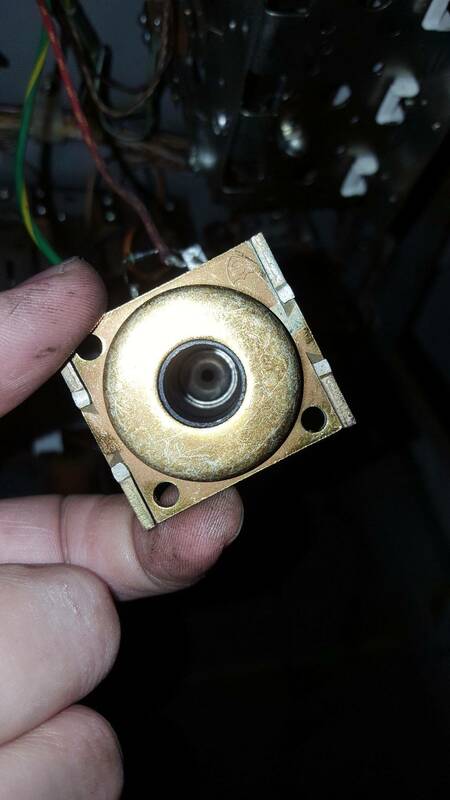 The plunger look to be the standard provide with this coil. A first glance, I believed that it was longer, but looking carefully at your picture, I'm now quite sure that it's not the case. Don't know the meaning of W2 * 1286 on the label. May be a wire gauge (type/turns), or may be a stamp of made (like integrated circuits ? 1286 ~ week 12 of 1986 ? ).